I never thought of the artist Walter Langley in the context of Birmingham, but that was actually where he was born in 1852. More commonly known as a founder of the Newlyn school, Langley had his Brum side as well, as seen by today's offering of a young lady waiting in the Market Hall (now the site of the Bull Ring). In 1881, Langley was given £500 for a years work by a Birmingham photograph and with that money he moved his family to Penzance and Newlyn. You probably know his work as being fishermen and women waiting for ill-fated fishing boats, and his wonderful watercoloured views of Cornwall. I am less familiar with his work beyond that but I found this little treasure while muff-hunting. 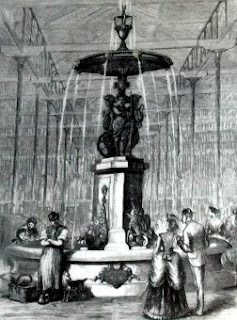 A young lady in smart clothes waits by the fountain in the old market halls in Birmingham. Who is she waiting for? 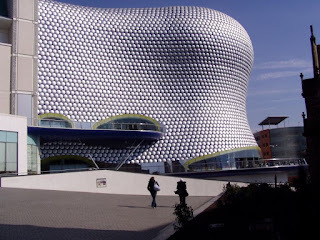 She looks like she is walking away - has she given up waiting? 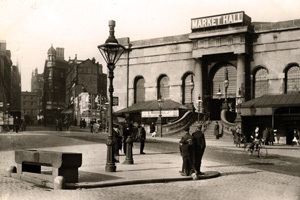 Opened in 1835, the Market Hall in Birmingham was built to tidy the stalls into one place rather than have them willy-nilly over the streets in ramshackle shambles. It was built to accommodate 600 stalls, with a fountain added in 1851 in the form of a Greek tazza, at the cost of £900. The fountain that our lady waits by was actually removed in the same year this was painted. 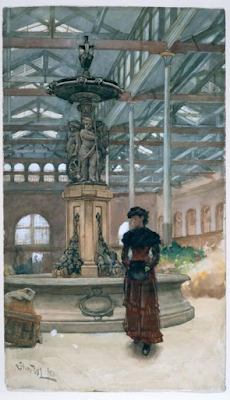 Did the artist know as he was painting it that the fountain would be gone, and is that what is to happen to the young lady? Is she off as well? 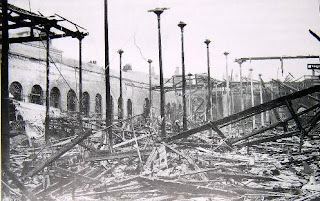 Birmingham was heavily bombed in the Second World War and the Market Hall took a few hits, hence the above photograph. You can still see the arches around the edges which are visible on the painting. It continued on without a roof for a while but ultimately was demolished to make way for the Bull Ring. Anyway, I like the Langley picture as you get a sense of what fashion was like in 1880. The clothes the woman is wearing are not ostentatious, but fairly simple and practical, with her muff as a touch of warmth. Often what we see in paintings is not 'street fashion' but something very specifically chosen for the image, but with Langley's girl you get the sense of someone who just happened to be there, waiting. 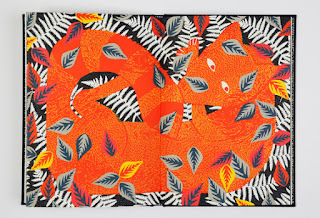 As you might remember from last year, I wrote a bedtime story for my Christmas Eve post. 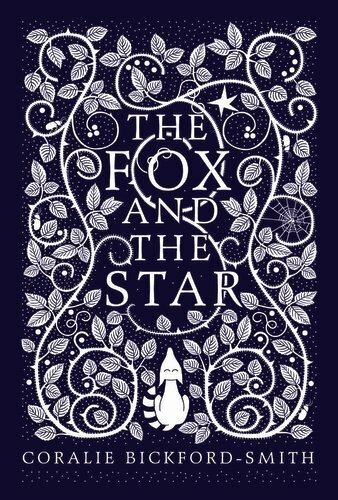 This year, my present suggestion to you is a foxy story written by someone else. 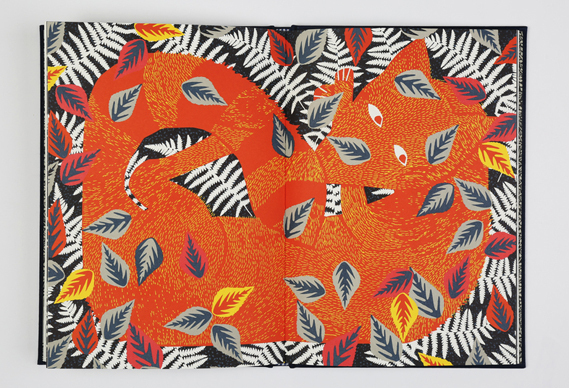 Beautifully illustrated and sweetly told, this is the stuff of proper bedtimes and so I urge you to pop into your local bookshop and nab a copy. It's available at Waterstones and obviously Amazon and probably little bookshops everywhere. 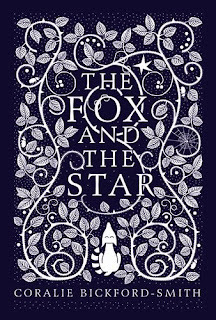 I have got The Fox and the Star - it's a lovely multi-layered book and is beautifully produced. Very interesting to see what was there before the bullring. 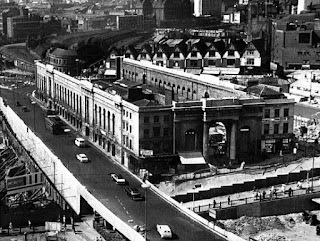 I quite like the way they've developed the centre especially the area near the canals but the new library is terrible!